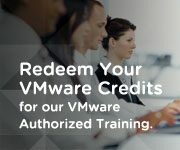 The VCP-DW 2018 certification validates that a badge earner can configure, deploy, manage, maintain, optimize, and perform basic troubleshooting of VMware Workspace ONE and related solutions, as well as properly identify and differentiate any needed supporting products and components. Gain experience with WorkspaceOne and Digital Workspace solutions. Attend one of the training courses. Confirm you have attended the required training courses. Pass the required certification exam. (Recommended) Attend one of the training courses.